Last week you very reasonably answered my question about how to punish mommy when she locks me in a room overnight. But mommy seems to think I should take some of the blame. She says, “Just because a door is open doesn't mean you should go inside.” But what else is an open door for? People seem to think opening doors is for moving from one room to another. They don't understand that open doors are an invitation to explore. 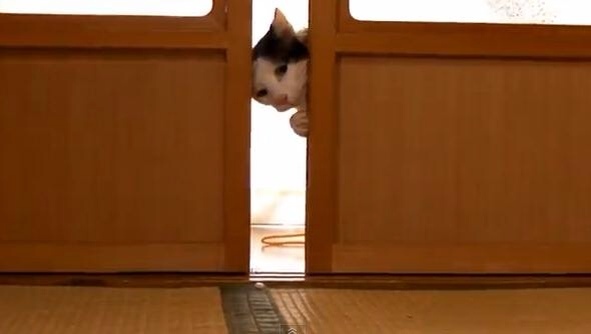 A cat can't see an open door without exploring. Who knows what's hiding there? So your mommy should just leave the door open, and with proper training, she will. Follow your mommy around for a week or two. Every time she opens the door, dash inside. If she calls you, don't come out. If she closes it, immediately start scratching and yowling until she opens the door. But don't leave the room just sit there. It worked with our mommy Carol. Now she never closes a door and we can all pile on mommy and daddy's bed at night. My mommy Carol says that your mommy shouldn't bother to close the door because Stephen and Nathan are just going to open it and leave it open anyway. But then she said that if she leaves it open, Stephen and Nathan will close it just because that's what thoughtless boys do. Boys are terrible thoughtless creatures. Daddy Phillip used to let his boy stay and he would carry us around by the neck and lock us in closets and shout at us to scare us when Daddy and Mommy weren't looking. There is good news. He disappeared a few years ago, and we hardly every see him. Stephen and Nathan will probably go away too.